Several days before the "Hearts and Hands of David" workshop, it was decided that a few of the workshops scheduled for two days would be reduced to one, for the sake of attendance. I was a bit wary of that, but it turned out to be a blessing—because instead of having 11 attendees, I had at least 22. Judging from the enthusiastic discussion and positive feedback, I think the presentation was a success. Certainly not because I'm a wonderful speaker or anything, but because it seemed to have gotten some gears turning. And that was the whole point. So I'll conclude today by attempting to do the same for my readers. After digesting the opening sermon and keynote a little, I was able to verbally insert some relevant points into my lecture that were not included in the paper. With any discussion on worship, music, and art, I think it is important to include real-world applications and examples. It's one thing to agree with an abstract or theological statement; it's quite another to put it into practice in our own congregations. The following are some of my expanded thoughts on those "side notes" in the presentation. I think there are abundant examples of people who have the "heart" to serve God, to create new places of worship and works of art, but they don't have the "hands," or the gifts, to create it themselves. But instead of finding someone from that third group, someone with both the "heart and hands," it often occurs that they find artists from the first group—those who have artistic gifts, but no particular desire to use them to God's glory or the edification of his Church. How can this be expected to work? How can we expect people who do not worship God to create something that will take into account the many facets of Christian theology and worship? Sometimes, despite the contradiction, this can produce desirable results—but only if the church's building committee is well-informed, has a good idea of what they want, and holds its ground in matters of theological symbolism, tradition, aesthetics, function, etc. There are a few examples of this. 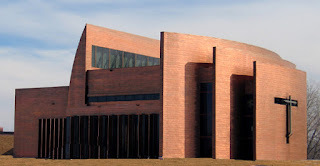 For instance, Faith Lutheran Church (WELS) in Antioch, IL, built a beautiful structure that, while modern, reflects a strong level of involvement by the theologians, musicians, and informed laymen (see below). Martin Luther College's Chapel of the Christ is another great example. Both of these worship spaces feature a triptych, oddly enough. And they are both undeniably beautiful, superbly functional, deeply symbolic, traditional, and yet modern worship spaces. So while it is possible to achieve good results with this approach, I think it will always be an uphill battle. But I most often see cases where the battle was resigned before it began. In other words, the "vision" of the architect or the artist took priority over considerations of tradition, symbolism, aesthetics, and function. I can think of dozens of examples. 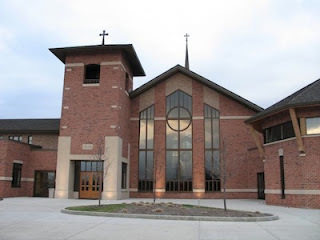 But one that sticks out in my mind, and is probably familiar to many members of the WELS, is St. Croix Lutheran High School's chapel (see below). It's a clear example of an artist or team of architects using the worship space as a billboard for their artistic ingenuity, originality, and expression. This is the difficult thing. Christians are hesitant to cause offense, especially in matters we consider to be adiaphora. But sometimes it cannot be avoided. We are not doing ourselves any favors when we compromise our values of excellence in worship for the sake of being polite. Someone has to say that the Emperor is naked. Art of the past century has indoctrinated us to believe two things: 1) that art is subjective, and 2) that "real" art is too deep for anyone but the "elite" to understand. We are supposed to stand in awe of Jackson Pollack because the artistic elite in the 1950s thought his "action painting" was only the culmination of five millennia of art history. And so our laymen are tricked into going along with this or that architectural plan, mosaic mural, or zen rock garden because 1) art is subjective anyway, and 2) what do we laymen really know about art? Until people start to listen to their gut—their consciences, even—and object to this silliness, it will continue to find its way into our churches. You have every right and responsibility to speak out, because: 1) art for worship is not subjective. It is as objective as art can be. It submits itself to the Word of God, to the gospel, to the sensibilities of faithful Christians, and to the wisdom of the historical Christian Church. 2) Art for worship is not elitist. It must be as universal as art can be. It must be readily accessible to laymen. It submits itself to the clear communication of the gospel message. These are objective measuring rods. If the art in our churches does not measure up, we must seek to replace it with "whatever is true, whatever is noble, whatever is right, whatever is pure, whatever is lovely, whatever is admirable...excellent or praiseworthy," and to look upon such things. There are Lutheran artists and architects who have a heart to worship God and the gifts to create excellent and worshipful art. Seek them out, and the Church will benefit from it. Wonderful posts, Jon. I share your concern in your second of the three posts. It's the same way with modern electronic/internet media. Some churches try to get rid of the building altogether and have "Church Online" This is what my thesis was about. When I actually get time later this summer, I'll hopefully be expounding on it. But, it obviously creates problems of its own by not even allowing what the service is meant for in the first place, since you can't have an assembly gathered around the preached word and partaking in the sacrament. Even if churches don't go this far, they can still use technology in other harmful ways. I know what you mean, Jeff. I was actually asked to speak on projection art or art in technology for the workshop. I decided not to because, for one, I have no real experience in that area, and secondly, any artistic consideration has to keep in mind a proper focus on worship. I think when people undertake to study a biblical view of worship, the rest will take care of itself.